If it seems like secession is become a more frequent topic in the global media, it's not just your imagination. In recent years, talk of political separatist movements have become not only more commonplace, but are increasingly discussed as reasonable alternatives to the status quo. Historically, of course, established states have long sought to portray secession movements as unsavory forms of agitation pushed only by extremists. In the US, of course, secession has long been portrayed as strictly the realm of right-wing zealots motivated by racism, or even something worse. In 2014, however, it became increasingly clear that this strategy's days were numbered. 2014, of course, was the year that 45 percent of Scottish voters voted to secede from the United Kingdom. Less than two years later, a majority of British voters voted for secession from the European Union — in spite of a hysterical scare campaign waged by pro-EU activists. These British secession movements were immune from the usual "arguments" against secession made in the United States. After all, were we to believe that British secessionists were pushing secession so they could impose slavery within their borders? Had it been used, such a charge would have been laughed at, so this new type of secession was generally ignored, or described as something other than secession. Moreover, the Scottish secession was problematic for the global left in general. Secession movements had often been portrayed by global elites as reactionary or at least the sort of thing that conservative malcontents would indulge in. But in Scotland, the secession movement was largely a product of the mainstream leftist parties. In the wake of the Scottish referendum, we were to believe that 45 percent of Scottish voters were extremist malcontents? Again, such a charge would have rightly been viewed as ludicrous. Since Brexit, two of the most notable secession movements — California and Catalonia — have also been products of the left. Given the mainstream media's fondness for the left, the effect of this has been to push secession out of the "extremist" shadows and into the realm of allowable — if eccentric — political discourse. What’s more, when international actors intervene in nationalist conflicts they increasingly promote sovereignty referendums. For instance, in 1999 Portugal brokered a referendum in East Timor, which was administered by the United Nations. Some observers have even suggested that there is a new international norm emerging requiring referendums to legitimate territorial realignments. This isn't to say that secession is now an easy thing. Status-quo states almost uniformly oppose secession movements within their own borders. This is because states naturally seek to enlarge themselves and increase their monopoly power over larger and larger territories. When geographic territories secede, they can no longer be directly taxed — and states don't like to give up their taxing powers. In many cases, seceding territories offer geopolitical advantages that the status-quo states are unlikely to relinquish. In some cases, if the status-quo states are convinced that the seceding territory will continue to be friendly toward them, secession may be tolerated. This was the case when Australia and Canada were granted independence from the United Kingdom, and when the Philippines was granted independence from the United States. In all cases, it is assumed that the former territories will be reliable military allies in case of global war. Unilateral secession referendums, in particular, are rarely implemented. Neither Catalonia nor Iraqi Kurdistan has a clear path to independent statehood. Nor do Azerbaijan’s Nagorno-Karabakh region, Bosnia’s Srpska region, or Georgia’s Abkhazia and South Ossetia, all of which voted for independence during the 1990s. In all of these cases, the status-quo states fear that secession may lead to advantages for competing states. But, it is increasingly accepted that secession and "sovereignty referendums" are multi-faceted in their motivating factors. Moreover, research suggests that secession movements can also help to promote peace. In his dissertation, Micha Germann concluded that "self-determination referendums are likely to create a positive dynamic and increase chances for peace ... they are likely to foster perceptions of fair decision-making ... they may contribute to a reversal of hostile images ... they may lead to referendum-related coalitions that are willing to support their outcome." And perhaps most importantly these movements may "increase the durability of settlements." However, to gain these benefits — according to Germann — secession movements must come at the end of a negotiation period in which the status quo state is convinced to allow for the referendum and abide by its results. Of course, states aren't likely to sign off on these referenda unless pressure is applied, whether via international pressure, domestic protest movements, or even through violence. Secessionists have to find some way to make secession the least bad option for a state. At the core of all of this, however, is the realization that it is morally objectionable and absurd to insist that current borders of a state are forever sacrosanct that everyone currently within a certain state must remain forever so. Given the perpetual lip service paid by modern states toward "democracy," it's becoming increasingly difficult to dismiss sovereignty referenda without looking hypocritical. The realization that secession can alleviate intrastate conflicts would not come as news to Ludwig von Mises who advocated for referenda as a tool in secession and the readjustment of national borders to align with nationalist, linguistic, and cultural trends. Sometimes, Mises noted, the only way to protect the rights of minority groups is for them to secede from one state, and perhaps join another. 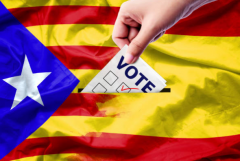 For Mises, who was an expert on the nationalist movements of nineteenth century Europe, and who supported the Catalonian secessionist movement in his own day, "sovereignty referenda" were a natural and reasonable way to adjust political realities to cultural and ideological realities. Allowing majority-controlled governments to impose their values and agenda on minority population was akin to military occupation in Mises's mind, and required secession as a solution. Mises, however, was writing on these matters in the 1920s, when nationalist, totalitarian, and fascist movements took a dim view of secession, to say the least. Today, however, it looks like Mises's pragmatic and savvy views on secession were a glimpse into what many researchers are now coming to realize about secession and its benefits.